But what makes a show binge-worthy versus a show you watch once and move on from? 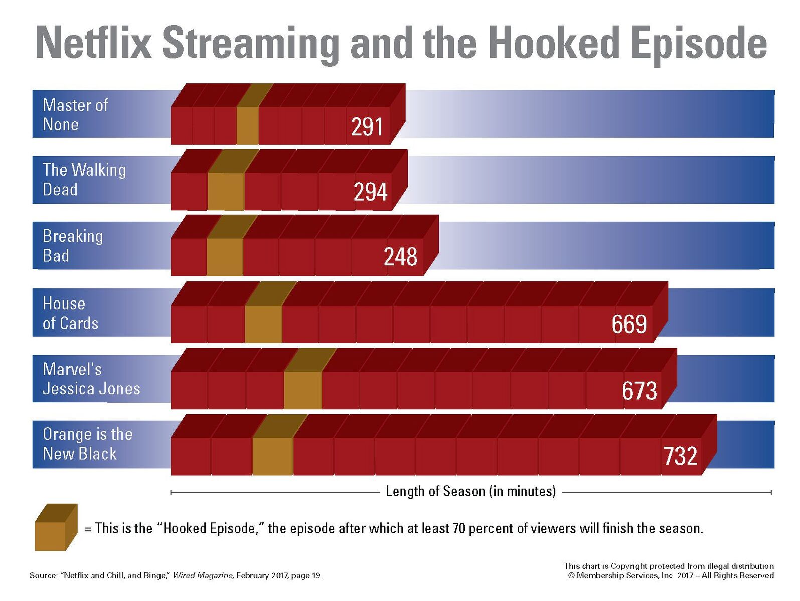 I was fascinated by Netflix data published by Wired magazine that shows when a series becomes addictive. The chart shows the length of each series in minutes together with cubes representing episodes. The gold cubes represent the “hooked episode.” This hooked episode is the episode after which 70 percent of the viewers complete the entire series. Some complete the series within a week, others savor the show over several months. Yet, after the hooked episode, 70 percent stick with the series until the end. This brings up an important question for you: At what point do your new subscriber members become hooked? You see, this is the exact same pattern I see in every membership and subscription program I’ve studied in the past two decades. A lot of new subscribers start, but many of them disengage in the first few weeks or days. Then a group reaches the “retention point,” where 70–80 percent become subscribers for life. Most subscription programs leave the retention point to chance. Heck, few even have the numbers necessary to determine what their retention point is. Armed with the Netflix data, producers and writers are writing the first episodes of their series to move that hooked episode earlier in their series. The quicker viewers get hooked, the more likely they are to watch the entire season, giving the producer funding for the next season. This is similar to your subscription. Getting your subscribers to the retention point faster is the secret to slashing churn rates. I’ve dedicated my career to orchestrating that retention point. Moving your retention point earlier in your subscriber life cycle is the key to long-term growth. The retention point is when your subscriber decides that he wants to be a member of your tribe, that he’s engaged, and he’s going to do what it takes to succeed. There is rarely a visible success that you or I could recognize. Instead, it’s a decision. You move subscribers to this retention point by inspiring them to improve themselves, giving clarity over their pathway to improvement, helping them take the first step, and revealing your unique personality. When you’re intentional about these components of your new subscriber welcome, you can move your retention point to immediately after the sale.